The speed of line scan cameras has greatly increased in the last years. 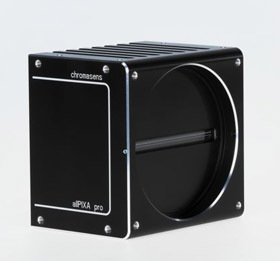 Modern line scan cameras operate with integration times in the range of 15 µs. In order to achieve excellent image quality, in some cases illuminance levels of over 1 million Lux are required. One of the most important criteria for assessing image quality is noise disturbance (white noise). There are various noise sources in image processing systems and the most dominant one is called “shot noise”. Shot noise has a physical cause and this has nothing to do with the quality of the camera. The noise is caused by the special essence of light, by photons. The image quality depends on the number of photons which hit the object and ultimately on the number of photons which reach the camera sensor. The choice of lens aperture greatly determines the required light intensity. If, for instance, the aperture is changed from 4 to 5.6, twice the amount of light is required in order to maintain the same signal to noise ratio (SNR) – see fig. 01). By using a greater aperture, more depth of focus is achieved and the image quality is improved due to reduced vignetting effects with the majority of lenses. LEDs are available in various shades of color. You can get them in red, green, blue, yellow or amber. Even UV LEDs and IR LEDs are obtainable. The choice of a specific color and thus a specific wave length can determine how object properties on surfaces with diverse spectral response are made visible. In the past, red light was often used wherever high intensity was required. However, relevant performance increase in LED technology today usually occurs with white LEDs. These high-performance LEDs are used for example in car headlights and street lamps. The core of a white LED actually consists of a blue LED. Using fluorescent substances, part of the light from the blue LED is converted into other visible spectral ranges in order to produce a 'white' light. UV-LEDs are frequently used to make fluorescent effects visible. In many cases a wavelength of approx. 400nm is sufficient. UV-LEDs with shorter wavelengths may be suitable for hardening paint, adhesives or varnishes. In comparison to blue or white LEDs, UV-LEDs are less efficient. By focusing through a reflector however this can be improved. IR lighting is implemented for food inspection. Wavelengths of 850nm or 940nm are used. When sorting recyclable material, wavelengths from 1,200nm to 1,700nm are used to identify different types. Here however, IR-LEDs in this range are not as adequate as classic halogen lamps with appropriate filters where beam output is concerned. The small design enables a very short warm-up phase. This circumstance presupposes good thermal dissipation, in order to maintain appropriate working conditions, i.e. temperatures. As a rule: the better the cooling, the longer the LED durability. Apart from durability, LED temperatures also influence spectral behavior (possible color shifting) and general output (luminance). In systems where precise color reproduction is required, it is recommended to keep the lighting’s temperature steady at a predetermined value. At present, efficient control systems can regulate the LED temperature to within a spectrum range of less than 2°C. Modern lighting systems, such as the Corona II lighting system developed by Chromasens, provide numerous cooling options. This includes passive cooling with thermal dissipation via convection, compressed air cooling, water cooling and ventilation. Active ventilation, compressed air or water cooling are good cooling methods for measuring applications situated in surroundings with high temperatures. By monitoring the temperature of the LEDs and regulating the cooling system, shifts in color reproduction can be completely avoided or at least greatly reduced. If a flat object at a known and fixed distance is to be illuminated, selecting the adequate focus is relatively simple. Selecting the right lighting is more complicated, if the object is not at a predetermined distance from the light or has no flat surface. In such a case, assuring a permanently sufficient image brightness is a challenge. Here the use of reflector technology facilitates the accumulation of light from a LED (greater coverage angle of the reflected light) and a better light distribution from the depth. In contrast to background or bright field lighting, focused lighting is normally used for top lighting. Customary lighting systems use rod lenses or Fresnel lenses in order to achieve the necessary lighting intensity. Chromasens adopts a novel and completely unique approach. While the use of rod lenses causes color deviations due to refraction, the mirror (reflector) principle developed and patented by Chromasens has no such trouble. Shiny or reflective materials are a challenge for lighting. Unwished for reflections often appear in the image. In combination with a polarizing filter rotated 90 degrees in front of the camera, these unwanted light reflections can be prevented. When using such filters, certain factors have to be considered. The temperature stability of the filter is one point. In this respect, many polarizing filters can only be used to a certain extent. Another criterion is effectiveness: with such settings, only about 18-20 % of the original amount of light reaches the sensor. The amount of light provided by the lighting must therefore be great enough to minimize noise and yet achieve sufficiently good image quality.